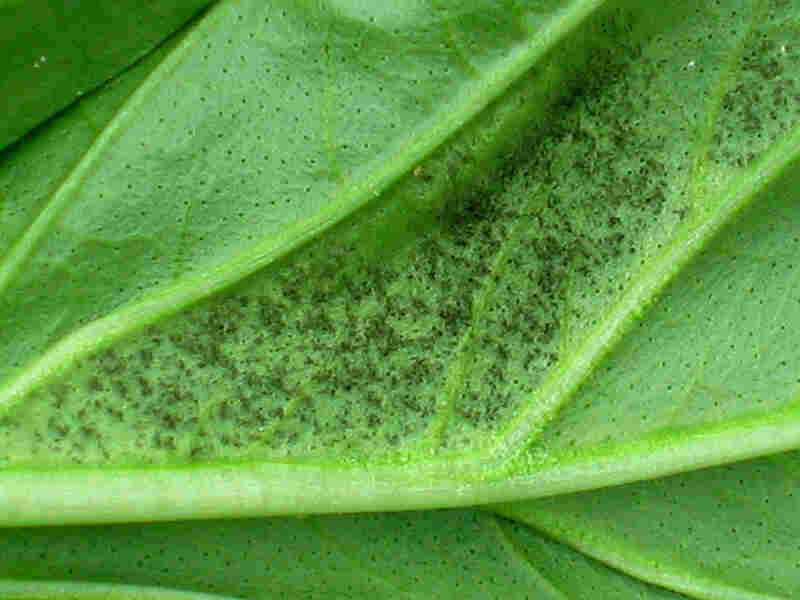 Basil Downy Mildew Threatens Basil Plants A potentially fatal fungal disease called downy mildew has been attacking basil plants in New York, New Jersey, Ohio and Florida. Gardeners are worried that it could spread farther throughout the summer. Margaret McGrath, an associate professor of plant pathology at Cornell University, says that at first sign of the blight, make pesto and freeze it. 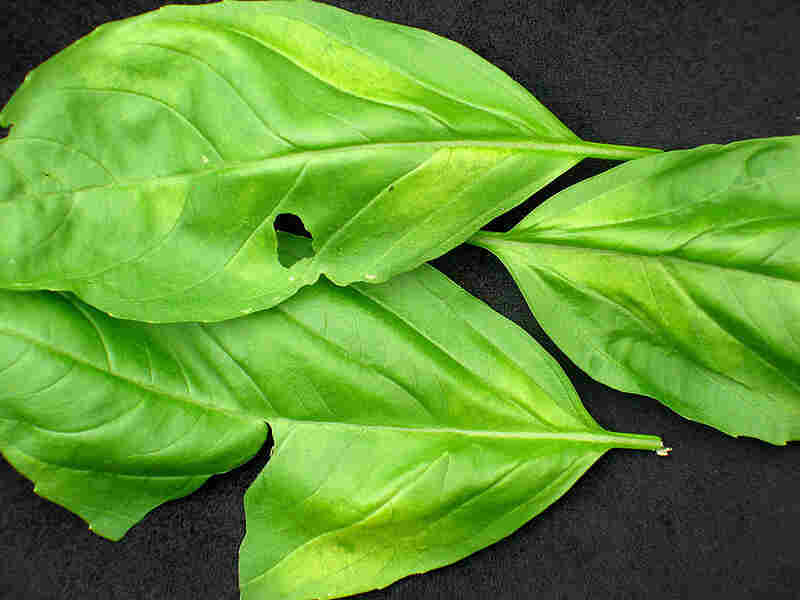 The yellowing of basil leaves is an indicator of basil blight. There's bad news for gardeners who grow basil to sprinkle over Italian food or Thai dishes -- or anyone who thinks pesto is the best flavor on Earth. And it spreads fast, says Margaret McGrath, an associate professor of plant pathology at Cornell University. "It wipes the leaves right out -- and that's what you want to use," McGrath tells NPR's Michele Norris. "And it can go pretty darn fast. And it's new so people don't know about it." So-called basil blight is similar to late blight in tomatoes or downy mildew in cucumbers, squash and melons. McGrath says these are considered "community diseases" because they move easily. It wipes the leaves right out — and that's what you want to use. And it can go pretty darn fast. And it's new so people don't know about it. "If you have it in your garden, you can affect other gardeners and farmers because the pathogen can jump onto their crops and plants," she says. McGrath says basil blight was reported in Uganda in 1933 and wasn't reported again until 2001 in Switzerland. The sign of the blight, McGrath says, is the top of the leaf will start yellowing. But to really know the state of the plant, you have to flip the leaves over and look on the undersides. "You'll see a grayish, almost purplish dusty growth on the underside, sometimes turning to almost black -- and that is all of the pathogen spores. And there are incredible production of them on the underside of the leaves," she says. "The wind will pick those up and blow them off and the disease just keeps multiplying like crazy." McGrath says that if you see the blight, you could get rid of the leaves, but if you remove one, you'll probably knock around the spores and they could get on other parts of the plant. She suggests making pesto on the spot with the healthy leaves when you see the first signs of blight. To really know the state of the basil plant, you have to flip the leaves over and look on the undersides — and see if there is a dusty grayish, purplish or blackish growth (pictured). "When I've had outbreaks, particularly last year, when I first saw it, which was the beginning of August, I looked at my husband and I said, 'We're not waiting till September when we normally made pesto. Get the machine out, we're making pesto now.' And we just harvested everything out of the garden and made pesto." Her method of storing it is to make pesto balls, put them in sandwich bags and freeze them. But, of course, McGrath says: "It's not the same as the fresh leaves."